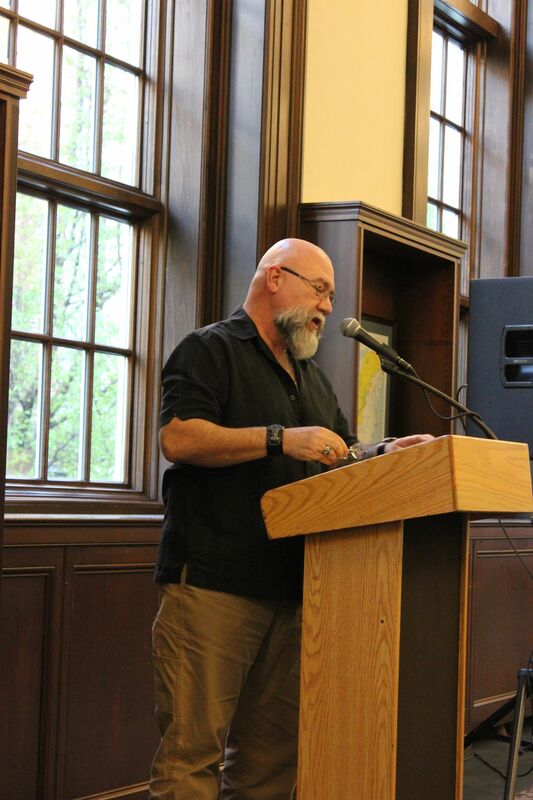 Various organizations at West Virginia University, including the Office of Multicultural Programs and the West Virginia and Regional History Center, sponsored my recent reading at WVU. Thanks to a few MFA students and colleagues who were willing to handle my classes at Virginia Tech, I was able to spend several enjoyable days in the Mountain State. On Tuesday, April 11, I drove up to Morgantown, a trip I’d made many, many times before as a student and later as an instructor at WVU in the late 70s and 80’s. A very pretty few hours: the redbud and sarvisberry were all in bloom, and the hills were leafing out in that green-gold that always reminds me of Robert Frost’s poem “Nothing Gold Can Stay” (the only poem I can recite from memory). As an apropos soundtrack, I listened to the CD of Brad Paisley’s Life Amplified World Tour: Live From WVU. I stayed with Jason Burns, a mover and shaker in the WVU Office of Multicultural Programs who’d helped finesse my invitation to read, and his husband, John P. Mullins, one of whose memorable stories I borrowed for a snake-handling scene in Country. Both men are excellent storytellers, and John’s a great cook. He made a tasty sausage/onion/cabbage dish and Teays Valley cornbread spiced up with roasted poblano, and then we settled into Bowmore’s 15 Year Old Scotch, a dark single malt I highly recommend. We were attended by the felines of the house: Lord Franklin, Augustus, and Jasper. Wednesday morning, I drove out to Cheat Lake to meet a former colleague, Katie Fallon, at Ruby and Ketchy’s, a roadside diner I used to frequent as an undergraduate (when I had the money to eat out, which was rarely). Katie is a fine writer who’s published two books, Cerulean Blues: A Personal Search for a Vanishing Songbird and Vulture: The Private Life of an Unloved Bird. After breakfast—knowing I’d have no time for lunch that day, I loaded up on country-fried steak, eggs, and buckwheat cakes—Katie took me to the Avian Conservation Center of Appalachia, which she helps run, and I got to visit with several screech owls, a barred owl, a red-tailed hawk, a peregrine falcon, a kestrel, and several vultures, both turkey vultures—Lou and Boris—and a black vulture named Maverick to whom I fed dead mice. 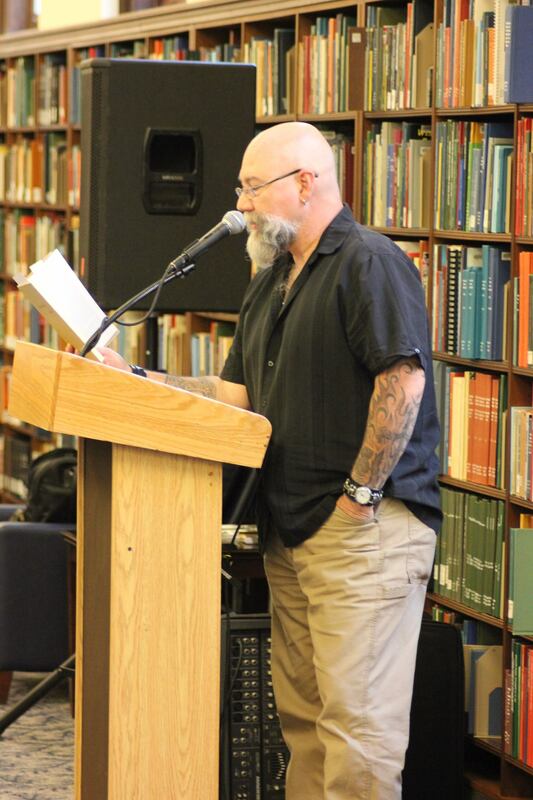 My reading occurred that evening in WVU’s Wise Library, which has been greatly transformed since my student days. 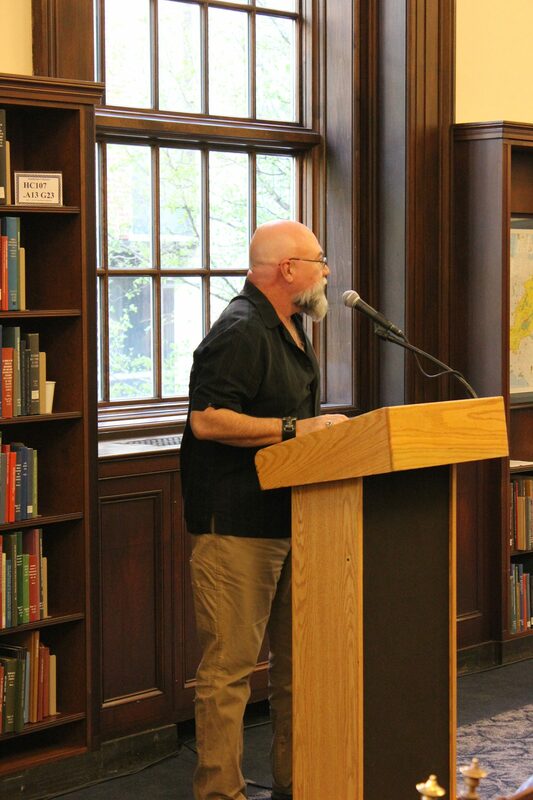 The huge room containing the bulky card catalogs with which I used to conduct research is now the Milano Room, home of the Appalachian Collection and a great space for a reading. To my surprise and pleasure, the collection owns all of my books but one. 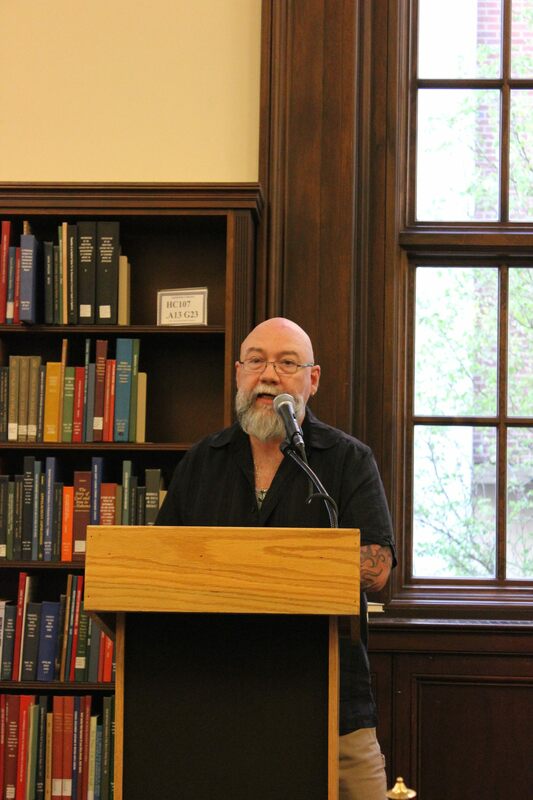 As an introduction, Tyler Chadwell, a young scholar whose research expertise is LGBT literature in Appalachia, gave a great talk on that topic, the perfect way to put my publications in context, and then I read from Loving Mountains, Loving Men; Cub; and Country (the aforementioned snake-handling scene, since John Mullins was in the audience). 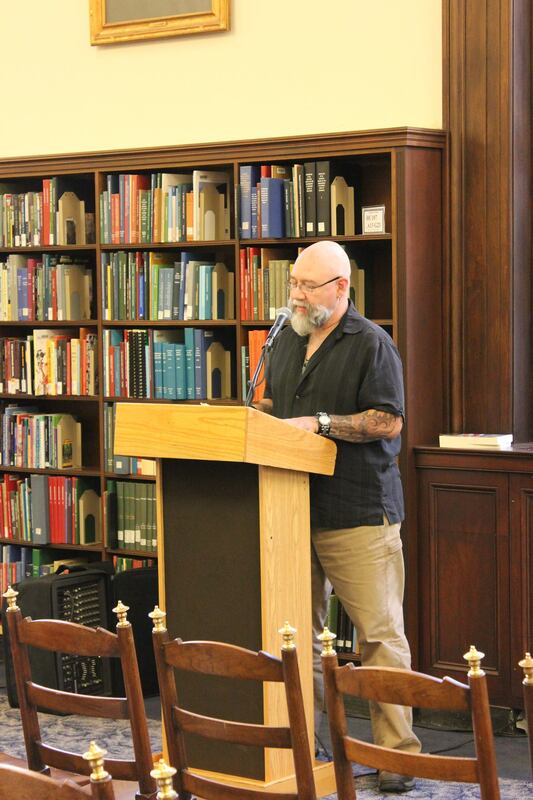 In a perplexing case of bad planning, the LGBTQ+ Center had invited another gay speaker to campus during the very same week that I was there, so none of the LGBTQ+ Center folks or members of the LGBT student group, Spectrum, attended my reading. Perhaps they were all exhausted from attending queer events on campus, since I’m sure that WVU hosts gay Appalachian authors like me every other week. The people who did attend were enthusiastic and asked several smart questions. 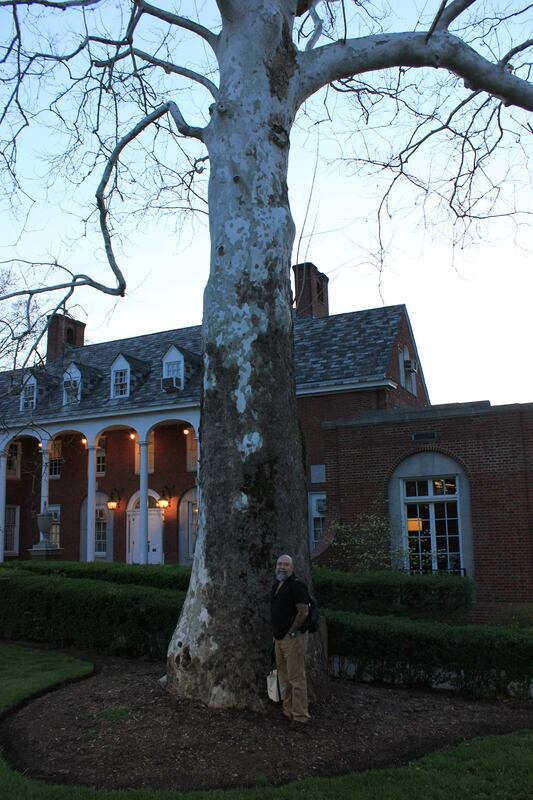 Afterward, John Mullins and I visited an old friend of mine (and I do mean old): a huge sycamore in the middle of the downtown campus, right in front of Elizabeth Moore Hall. We also checked out the monument to Mountaineer Field, the old stadium in which I used to attend football games. Then John, Jason, and I shared some spicy Asian food at Ta-Khrai Thai Café. Thursday was more international food and catch-up: Tyler Chadwell kindly treated me to lunch at Yama, a Japanese restaurant, and I met an old friend, Fran, for dinner at Jasmine Grill, where we enjoyed Syrian food, reminisced about sharing an apartment in the summer of 1982 (715 Willey Street, the topic of an essay of mine in Binding the God), and cursed the fulvous cretin in the White House. Friday, I headed south to my hometown of Hinton, visiting Carnifex Ferry Battlefield on the way, one of the few Civil War sites in West Virginia I had yet to get to. It has an amazing view over the Gauley River. My old friend Cindy Burack and her housemate Lee drove down from Columbus, Ohio, to meet me for the weekend in Hinton, as did my husbear, and we enjoyed what I call a Big Queer Convocation in the house I grew up in, which John and I bought several years ago. That house served as a setting in Country, and, more recently, the convocations have inspired a new essay of mine, which will be published in May 2017 in Unbroken Circle: Stories of Cultural Diversity in the South, due out from Bottom Dog Press. Next Post:ARE YOU READY TO GET NAUGHTY? ?